Continuity mistake: In the end, all the pictures in the cousin's book are normal, but earlier Leroy tore Xs in each. 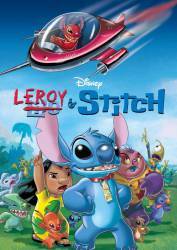 Some say that Leroy is experiment 628. Some people haven't noticed that in the episode with 627, at the end of the episode, Jumba had said, "Maybe next time will be better" as he places a pod that said 628. So 628 had already been created. He was never shown in the entire series, though Leroy is 629.